Place seed with proper spacing and at precisely the right depth with the seeder attachment. Unlike broadcast seeders, the seeder attachment is a ground-driven unit that seeds directly into the soil for better germination and more accurate coverage. Front rollers firm and press small rocks below the surface while also pressing seed into the seedbed. Rear rollers split the shallow ridges and gently form the soil around the seed, ensuring optimum seed-to-soil contact. This action eliminates broadcasting seed into unwanted areas such as flowerbeds and walkways. At a production rate of more than 2 acres per hour, the seeder attachment gets the job done quickly and efficiently. 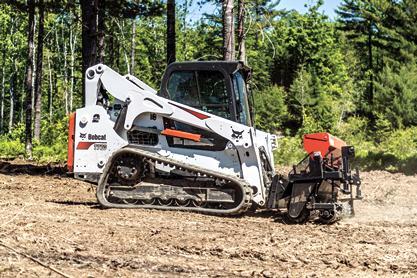 Can be front mounted on a loader or Toolcat™ machine, or rear mounted on a 3-pt. hitch. Seeding projects on landscaping sites, acreages, farms and more. Front rollers crush lumps and press down small stones to form a firm, well-prepared seedbed. Seed is precisely metered with the proper spacing and at the right depth, where it will germinate quickly. Rear rollers split the shallow ridges made by the front rollers and gently form the soil around the seeds, ensuring optimum seed-to-soil contact. The result is a perfect seedbed — smooth and firm, with small stones pressed down. Adjustable Gate Control: Adjust the gate to the desired setting for accurate control and metering of seed planting rates. Front and Rear Rollers: Front rollers firm and press the seed into the top half-in. of the seedbed, while rear rollers ensure optimum seed-to-soil contact. Hopper Capacity: At 4 bushels, the hopper’s capacity will cover several acres without refilling (depending on seed type and planting rate). 3-pt. or Bob-Tach™ Mounting system: Quickly switch between Bob-Tach™ and 3 pt. mounting options; attachment may be used on loaders.